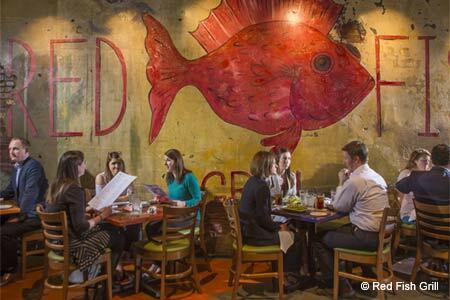 : Situated on the very first block of Bourbon Street, Red Fish Grill offers a welcoming perspective on the French Quarter. Another fine Ralph Brennan restaurant, the place has an enviable reputation for innovative seafood preparations, an achievement in a town known for seafood. Its several dining spaces spill over with whimsy and energy, and that concept follows through to the kitchen. At least a dozen types of fish are available from the wood-fired grill, and each may be ordered with a choice of six sauces. An oversize crab cake boasts nothing but fresh crab meat and seasonings. If you thought nothing new could be done with gumbo, it may be time to try the house alligator sausage variety. A long, cool oyster bar provides a good perch for knocking back a dozen bivalves. And since you’re being delightfully self-indulgent, finish your meal with bananas Foster ice cream cake. The wine list is extensive and well-conceived. Pay special attention to the limited offerings under Unique Whites and Unique Reds, a rotating section of distinctive and selective brands. Red Fish Grill features one of the French Quarter’s liveliest happy hours, which takes place at the oyster bar, where a full bar menu is available.